Frank Sinatra (Ray Liotta) reminisces on his days with The Rat Pack leading up to and following the election of John F. Kennedy (William Peterson). Frank Sinatra was an actor, a singer, and a Vegas icon. He used his celebrity status to create ties to some of the most powerful men in the world on both sides of the law. This movie explores Frank Sinatra's contribution to the election of John F. Kennedy, something neither BigJ nor I knew was a thing. It makes the claim Sinatra used his fame to gain Kennedy support for his presidency, as well providing him with female companionship when he was in town. Sinatra also helped Kennedy get friendly with Mob boss Sam 'Momo' Giancana to help swing union support behind him in his time of need. It also looks at his relationship with the other members of The Rat Pack, primarily Peter Lawford, played by Angus Macfadyen, who is Sinatra's in with the Kennedy's as Lawford is married to one. As expected, the Kennedy's and Sinatra eventually clash heads once they are elected into office, which should be far and away the most compelling parts of the movie, but unfortunately, the steam needed to roll the story along in a dramatic and fascinating manner just isn't there. We have no qualms with the subject matter at hand, and there are some interesting aspects to the film, even if they are fudged and falsified for dramatic effect. You never really know how much of a "true story" is true when it gets past the cutting room floor. The biggest problem we have with the film by far is we did not find Ray Liotta to be a very convincing Sinatra. Liotta never manages to fully leave himself behind and no hairstyle in the world would make Liotta one iota closer to becoming Sinatra. Of course, in 1998 and in retrospect, it seems like very few actors an actresses used their actual singing voice as many were either dubbed by the actual performers or sung by a third party, but Liotta's performance could have been aided a lot with a song featuring his real voice here and there. Boy, what a miscast. In fact, the only actor in the film we felt slightly convinced by was Don Cheadle as Sammy Davis Jr. We were able to believe him in that part and as an audience, we fully accept him in the role. He is also the best and the most interesting "character" in the film as he has to deal with pre-civil rights movement racism in America, especially regarding his relationship with and eventual marriage to a white woman. Joe Mantegna plays Dean Martin, and though he is much more convincing than Liotta, it still seems more like Mantegna doing a Dean Martin impression rather than truly capturing the essence of Dean Martin himself. We also find his character is underutilized, especially since he was a huge part of The Rat Pack, and we would have loved to see this movie dive deeper into his relationship with Sinatra and the rest of the gang. Though Bobby Slayton is featured on the poster as Joey Bishop, his character is almost a footnote in the film, popping up less than 5 times in a major way, maybe even less than 3 times. 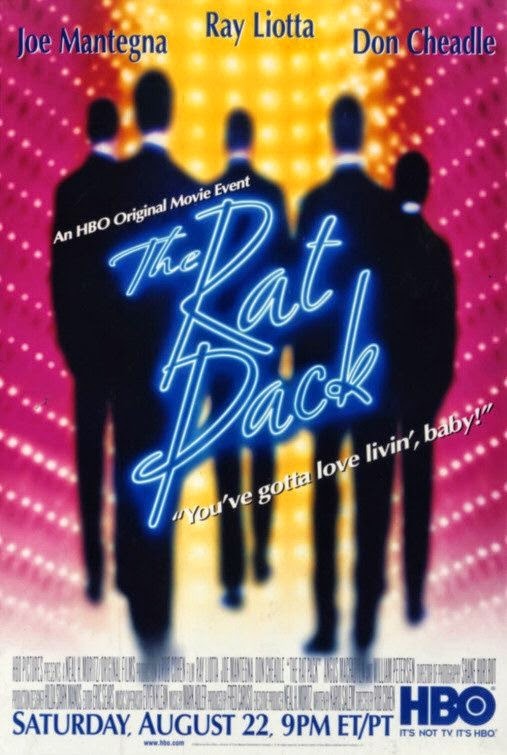 Though it is somewhat interesting learning about The Rat Pack and their involvement in politics and Kennedy's presidential election, it wasn't that engaging enough and didn't move us whatsoever. Though some of the production values are good for an HBO film, this particular movie is also rather slow paced, and by the end, we were glad it was over. One year ago, we were watching: "Muppets Most Wanted"